A well-defined jawline structure is the cornerstone of a balanced attractive face, male or female. By placing a custom-fit chin implant, a skilled cosmetic surgeon can add strength to a weak or recessed chin, improving facial harmony. Continue reading to learn more. What is chin enhancement surgery? Chin enhancement surgery, also called genioplasty, improves contours of the chin, neck and jawline. Typically, surgery involves placement of an implant around a patient’s existing chin bone to augment the size and shape of the chin and achieve a more naturally attractive balance between facial features. When performed by a qualified, experienced cosmetic surgeon, chin enhancement can provide a permanent solution to improve a weak or recessed chin. Why consider getting a chin implant? What does a chin implant look like? One of the most important decisions you will make when considering chin enhancement is who will perform your surgery. You’ll want to choose a surgeon who has extensive experience in facial cosmetic surgery. When consulting with potential surgeons, ask how many chin augmentation procedures he or she has performed, and be sure to look at before and after photos of other patients. The results you see should look natural to each individual patient. More about choosing a cosmetic surgeon. Chin implant surgery is usually an outpatient procedure, performed using general anesthesia or local anesthesia with sedation. A small incision is made either underneath the chin or inside the mouth. 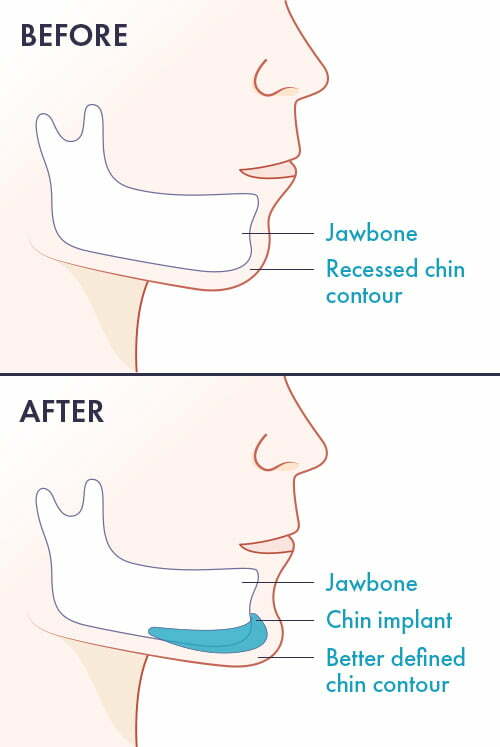 Through this incision, the cosmetic surgeon creates space for the chin implant and fits it around the chin bone. Chin implant surgery alone typically takes less than 1 hour to perform; however, if you are having additional procedures, operating time will increase accordingly. Following surgery, the incision is closed with sutures and the chin may be bandaged. Chin implants are small, solid devices made from a biocompatible material, usually silicone, which has been molded to fit around a patient’s chin bone. Chin implants vary in size and contour; your cosmetic surgeon will help you choose an implant that will achieve your desired degree of enhancement and provide the most natural looking result. When inserted, chin implants feel very similar to a natural chin bone, and when performed by a qualified cosmetic surgeon, it is usually impossible to tell that a patient has had chin augmentation. Most chin augmentation patients experience relatively little downtime and are back to desk work and most other daily activities within 7 days after surgery. Discomfort is typically minimal and easily controlled with pain medication or cold compresses. You will need to sleep face-up, with your head elevated, for a minimum of 1 to 2 weeks after surgery to help control post-op swelling and protect your healing incisions. Your cosmetic surgeon may also require you to consume a liquid-only diet for a day or two after surgery. Strenuous activity can typically be resumed within 3 to 4 weeks after chin augmentation. It is important to follow your cosmetic surgeon’s specific instructions during recovery to ensure you heal well and your results look great as soon as possible. Results look close to final within one month after surgery, and are considered final after about 3 months, when residual swelling has subsided. Chin implants are very strong, durable medical devices and are intended to be permanent. While the aging process will affect your facial appearance in other ways, your enhanced chin contour will not change. There is a slight risk that trauma to the face could damage a chin implant and require another surgery to replace it. When performed by a qualified, experienced cosmetic surgeon, chin augmentation is associated with very few complications. Possible risks include infection, hematoma (internal bleeding), shift in implant position, poor scarring, and side effects from anesthesia. You can further minimize risk by choosing a cosmetic surgeon who is certified by the American Board of Cosmetic Surgery. ABCS diplomates have undergone extensive fellowship training in cosmetic surgery, operate exclusively in accredited surgical facilities, and use a board certified MD anesthesiologist for general anesthesia. While many patients choose to have chin implant surgery alone, just as often chin augmentation will be combined with other procedures for enhanced results. Chin implants can dramatically enhance the results of rhinoplasty, and chin augmentation with nose reshaping surgery is one of the most common facial contouring procedure combinations. Patients with excess fullness beneath the chin often choose to have neck liposuction at the same time as chin implant surgery. While strengthening the chin will help improve jawline definition on its own, removing excess fat from underneath the chin can further improve the appearance of the lower face and neck. Want to learn more? Find a qualified cosmetic surgeon near you.